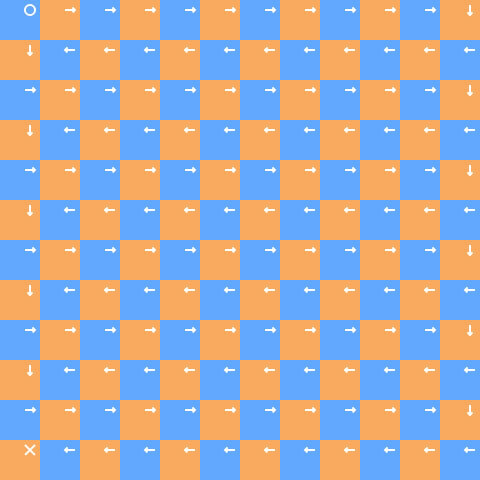 Ultimately I want to be able to draw a checkerboard (wall) of user-defined size. This wall is made up of tiles of a user-defined size. This main wall can then be split up into multiple sections (outputs) dependent on user defined limits. The data-flow is then drawn in each individual output(see Example 2), not just for the entire wall(Example 1). I was provided an elegant solution by user @Blindman67 that iterates through each tile in the map and sets it's flow in the order of the flow. This works wonderfully until I change it to set a tile to be the end of the flow once it reaches the limit of a single output. If you check out example 3 I start to add in some extremely crude if/else if statements to check for every possibility in the 8 different flows, setting the ends and beginnings of flows as well as arrow directions manually. This is extremely sloppy and I'd much prefer something more akin to what's going on in example 1, but with a working data flow drawn for each individual output. Here are two pictures of what I can do thus far. Looking at the 2nd picture, you'll see I want to be able to fill in the remaining 3 empty outputs with their respective data flows. Example 2 - Flow functions correctly within the limits of one single output. //round down LCDoutputy to the next coordinate evenly divisible by a tile's y value. //round down LCDoutputx to the next coordinate evenly divisible by a tile's x value. 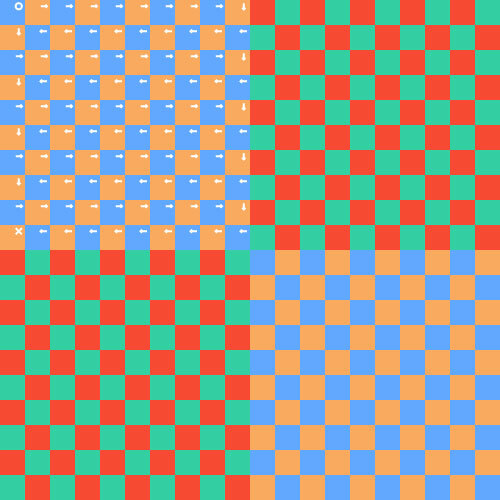 var d = (Math.floor(y / LCDoutputy) % 2 + Math.floor(x / LCDoutputx) % 2) % 2; //added LCDoutputt for output background color to work. Was outputy. The entire map's output background colors were off by one row, showing an extra row beyond what the limits should be.